The "Take It!" came from my fascination with mechanical claws. This one unexpectedly showing up in front of me, sort of hanging off the back of a big truck. Such a menacing look to be following down the road behind. 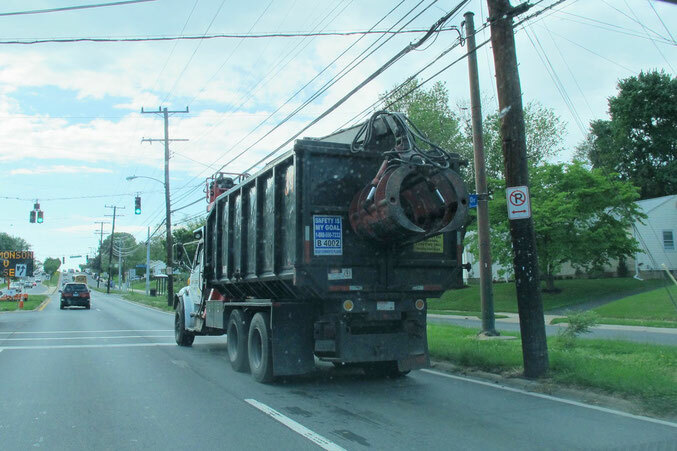 I Could not help but think of how funny it would be to have the driver of the truck do a little show of opening and closing of the claw when at a stop, just to see if it would have the driver behind him/her back way off when motion down the road resumed. The After Take: This is probably a truck used for picking up logs as I did manage to get up close enough to the front of the truck to read it was from a tree service company before the truck took a right hand turn and was out of my sight. It looked like a cool way to spend ones day, picking up logs made from trees in urban and suburban settings. The presumption being that they are able to sell the logs to be cut up and made into other things rather than cut up to be used as fire wood, or go into land fills. I have a sort of "Rescue Log" that I managed to bring to my house some time ago and had it cut up to be used to be made into a new dining room table for myself when it has dried out enough to be finished. Fun stuff that I will share when it gets further along. Thanks for joining us for the current photo presentation. You are cordially invited to return Tuesday, June 12th for a new picture that we hope you will enjoy. Hope your days are happy ones! You have quite the imagination, sir. I could never see the things you see and come up with as much as you do.